The violets in the mountains have broken the rocks. While today’s photo doesn’t include violets or mountains it still reminds me of Tennessee Williams’ quote from Camino Real. Symbolic opposites are incorporated throughout this play illustrating a world full of harsh contrasts and in the end we learn the only thing that conquers the broken is love and softness. 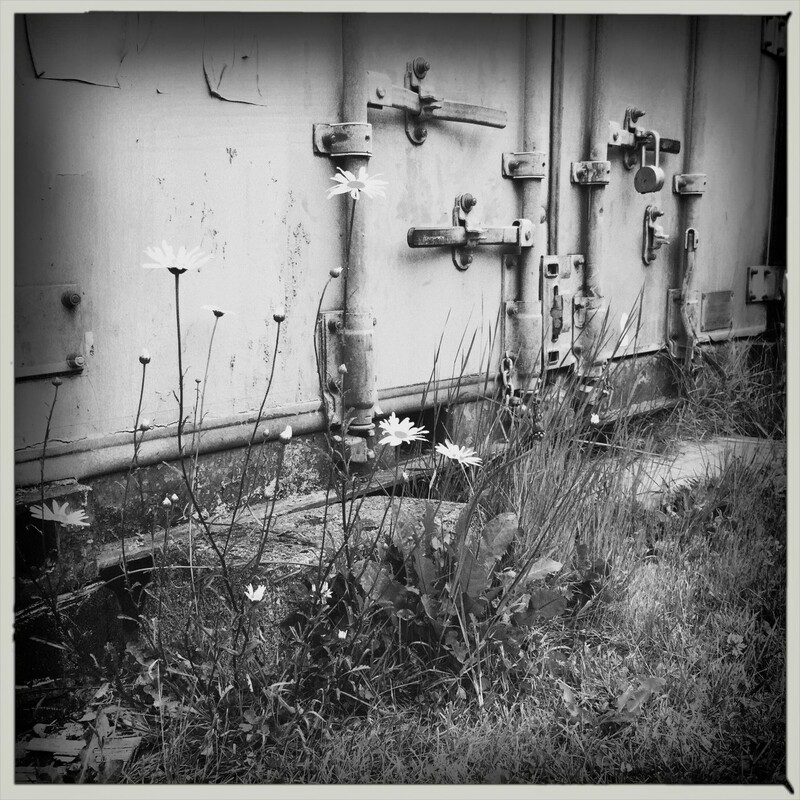 Here this derelict shipping container on concrete blocks is receiving some wild daisy love from Mother Nature. Posted as part of the Weekly Photo Challenge: Broken. Thanks, Yvette. 🙂 I’m happy to hear you found so many elements to view in this one. There is a lot contained in this small square and most of it is only visible when we slow down to study it. Very clever interpretation of the theme. It’s a lovely photo and thought melded together. Thanks, LD. It took me a few days to think of a different angle for this theme but I’m glad I waited. “…the only thing that conquers the broken is love and softness.” I love that lesson. It’s nice to hear you like it Lola! I love the juxtaposition – great discovery! aww, the quote is brilliant… goes so well with the photo!! just love this post!! Wishing My Beautiful Grandma Emma a Happy 97th Birthday!